I can't blame ya. I love Chef Boyardee! It's so satisfying somehow. V8 Vegetable Juice tastes exactly like the tomato sludge left behind after the last of the Chef's ravioli is eaten. Except the V8 is cold. And though the cold V8 is lots healthier than the warm muck di Boyardee, guess which is more appealing. mmm, comfort food. 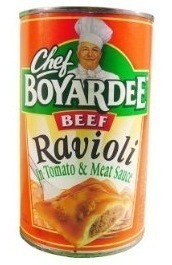 Was there really a chef named Boyardee? it's pretty tasty. Who am i to judge - i love vienna sausages! We shouldn't judge Chef Boyardee Ravioli for what it isn't, we should love it for what it is (-tasty). Corned beef hash from a can is da bomb diggety. But with a food processor one can make corned beef hash like that at home! Haha, all great points. Yes, very tasty, and insanely unhealthy. I think this was a tough realization recently, but -- I love unhealthy food. It's a curse!